Nothing stands still in social media. User behaviour, technology and functionality are changing rapidly and deciphering fads from transformational tools can be difficult. 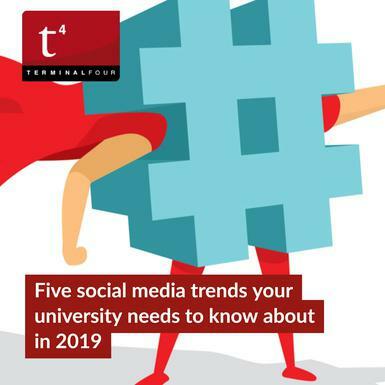 Here we've compiled five trends to factor into your institution's social media plans for 2019. People increasingly view video content in portrait mode because the majority of phone applications use a vertical orientation. In fact, less than a third of people will turn their phone around to watch videos. People will generally turn their phone around into landscape mode to see longer form content. For shorter form content though it makes sense to shoot this in portrait mode unless the material is really dependent on a wider screen format. This is, therefore, a good time for universities to experiment with a portrait format for future videos. This year will see universities leveraging the vast amount of quality content their students produce by seeking their help to engage audiences and create communities. Institutions can use contributor feeds across areas of the main website and other microsites as well as using hashtags to draw together experiences to one area. Taking content from existing and past students and bringing it into focus for prospective and new students taps into the power of word-of-mouth and delivers authentic content to them. Check out a recent blog post on Universities and Colleges using User Generated Content to help with student recruitment. While Instagram and Snapchat video thrives on sub-30-second clips, YouTube's most viewed content is actually over 20 minutes long. YouTube is fueling this trend as more watch hours keeps viewers on the platform for longer. Universities needn't throw out short form video content as it is ideal for Instagram and Snapchat as well as Linkedin and Facebook, but should also think about how to develop storytelling through longer form content on YouTube. Interviews with leading academics, student experience showcases, video tutorials and extended campus tour videos are all particularly well suited. While IGTV has some way to go before it becomes the popular episodic video platform its name implies, Instagram Stories is growing exponentially and it is now twice as popular as Snapchat. Instagram Stories is an excellent tool for showcasing the personality of a university and students' content can bring to life things like graduation, sporting events, concerts as well as the day today. For recruitment purposes, Instagram Stories also excels. Institutions can, for example, use video content for brand building, or for more specific engagement activities to showcase the campus and attract prospective students to open days and campus visits. Using academic lectures and profiles as well student testimonials demonstrates the educational pedigree of the university. From a digital advertising perspective, content can be developed specifically for Instagram Stories and delivered through Facebook Ads Manager with the same geographic, demographic and behavioural targeting you'll already be familiar with. Micro influencers typically have small, focused audiences on social media (2,000 to 100,000 followers) but with higher levels of engagement than large-scale influencers. Most institutions already have sophisticated social media activity underway and using influencers intelligently is a natural extension to this. Universities are now beginning to experiment by employing carefully selected ambassadors (successful alumni, graduates and well-connected students) to promote courses and attract students in an authentic, natural way. Keeping up to date and being proactive with the latest social media formats is now a necessity to avoid missing out on potential prospects. Harnessing the social media trends outlined here can help to carve out deeper, more meaningful, relationships with prospective students. But institutions should assess how these trends fit into their current strategic activities, and they must also find the right balance between organic content, sponsored content (UGC and influencers) and paid (social ad) campaigns. 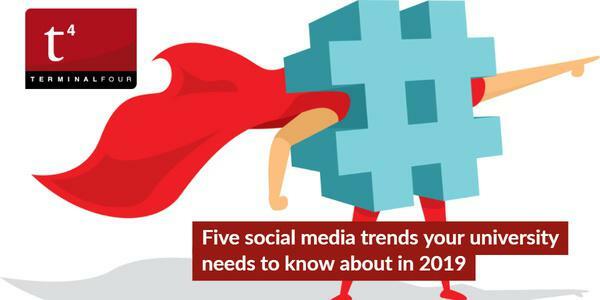 What new trends have you incorporated into your social media strategy for 2019? We'd love to hear.